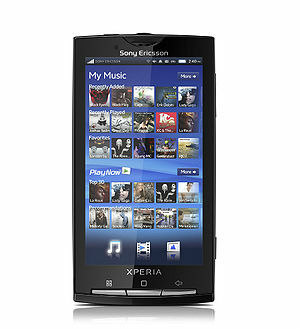 The Sony Ericsson Xperia X10 is a high-end smartphone designed by Sony Ericsson in the Xperia series. It is the first Sony Ericsson smartphone to run the Android operating system. The phone was shipped running Android 1.6 but an upgrade to Android 2.1 was made available starting from 31st October 2010, with a gradual rollout amongst global kits. Xperia X10 family will not receive upgrade to Froyo or beyond. The phone features an 8.1 MP camera and a 1 GHz Qualcomm Snapdragon CPU. The screen supports NTSC DVD wide-screen resolution. It allows users access to “apps” available in the Android Market. Connection speeds up to HSDPA (3G+) are possible with the handset. The UX platform gives Xperia X10 one application to lift together all the user’s different communications, Timescape, and one to lift together all the users media, Mediascape. An Xperia X10 functions as a camera phone, including text messaging, a portable media player, and an Internet client with e-mail, web browsing and Wi-Fi connectivity. The user interface is built around the device’s touchscreen, including a virtual keyboard rather than a physical one (Sony Ericsson Xperia X10 Mini Pro goes with a physical keyboard). Third-party applications are available from Android Market, which launched in 2008 and now (20 November 2010) has over 200,000 “apps”. These apps have diverse functionalities, including games, reference, GPS navigation, social networking and advertising for television shows, films, and celebrities. [Download Here] The instructions in this User guide, unless otherwise stated, are written on the basis that you access your phone’s functions from the default Home screen. If you set Timescape™ or another application as your home screen, the instruction path may differ. An extended User guide is available in your phone. The extended User guide and more information is also available at www.sonyericsson.com/support.